Hello and welcome to today’s OOTD. As you probably know, there’s been an epic heatwave here in the UK at the moment and so a couple of weekends back, my boyfriend and I made the most of the hot weather by wandering along the canal. In the midst of the London madness, the canal can be a great haven that instantly takes you away from the hustle and bustle. 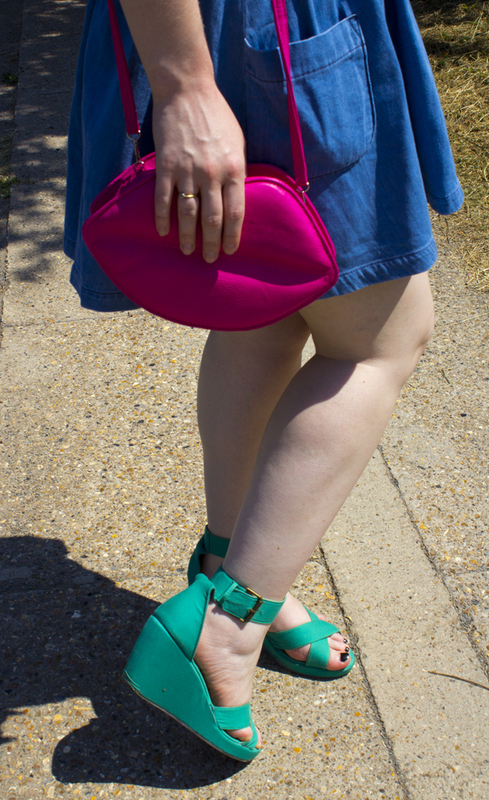 I went for an appropriately sunny outfit for this venture, that didn’t have a speck of black in sight! Being as it’s ridiculously humid- it’s the less clothes the better, so I opted for this cropped, sleeveless shirt from H&M that’s covered in cherries. To really make the pink in the top pop, I brought along my Johnnie Loves Rosie (via ASOS) lips bag that’s more than a little Lulu Guinness! I also wore one of my favourite lipsticks- NYC’s Air Kiss which is a gorgeous blue-toned pink, and perfect for summer, get it here. Finally I finished off the look with a low-key denim skirt from Miss Selfridge that featured in a recent haul (here) and which you can pick up here, and my green H&M wedges. My sunglasses as usual, are Forever 21.